USDA prime beef is the highest quality grade of beef. The beef has abundant marbling, the lines of white fat within the meat, and is produced by a young beef animal. Fine butcher shops and top restaurants sell prime grade beef. This beef is considered to be the most tender, juicy and flavorful cut. 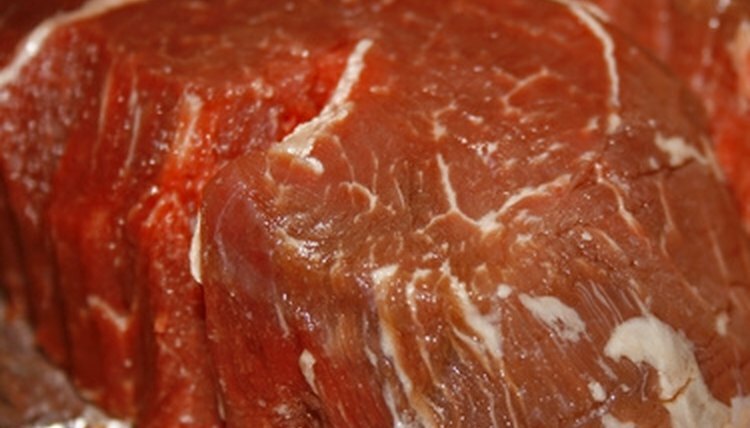 A long feeding period with a high-energy diet is required to produce prime grade beef. Select a medium frame (size) steer of a beef cattle breed. The Angus and Hereford breeds are popular for producing prime beef. Cattle of the Wagyu breed produce the high quality Kobe-style beef. Select a steer that is less than 15 months old when the feeding program begins. A prime grade steer is usually 24 months of age or younger at the time of processing. Start the yearling age 700-pound feeder steer on a grain and hay diet. Begin with a few pounds of grain and all of the grass hay the steer will consume in two 30-minute feedings. Corn is a popular feed grain for steers, but barley and wheat also produce favorable results. Increase the amount of grain in the diet gradually until the steer consumes a ration of approximately 80 percent grain and 20 percent hay. It should take about 40 days for the steer to reach this level of consumption. Feed the steer the equivalent about 1.5 percent of his body weight as feed. A 1,000-pound steer will consume about 15 pounds of feed. Continue this feeding program for six to nine months. Provide a regular health care program, fresh water and a comfortable pen with a shelter. Feel the fat cover over the steer’s back and ribs. A prime steer will have a thick, firm fat covering over the ribs and down the back. Inspection and Grading of Meat and Poultry: What Are the Differences?